Henry Peyton Wall was born on 30 July 1887.1 He married Patsy Bagwell, daughter of Calvin Berry Bagwell and Martha Cooper, on 17 November 1909.1 Henry Peyton Wall died on 19 June 1927 in Wake County, North Carolina, at age 39 Henry was employed as a clerk as Koonce Furniture at the time of his passing. He died on 19 June 1927 in Wake County, North Carolina, at age 39. 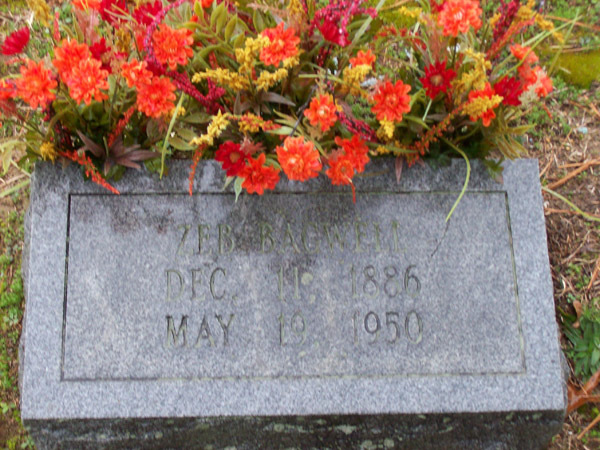 He was buried at Oakwood Cemetery, Raleigh, Wake County, North Carolina. 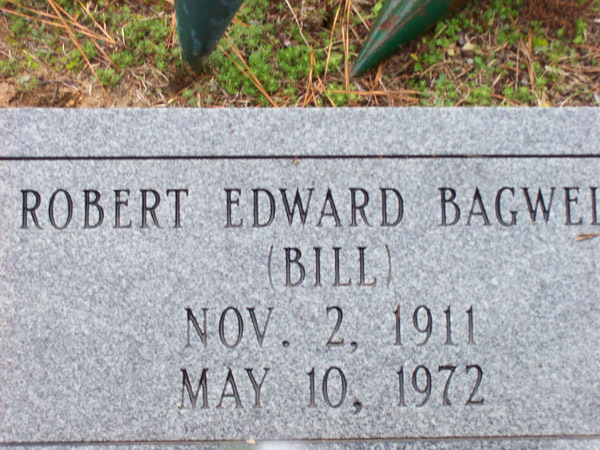 Robert Edward Bagwell was born on 2 November 1911.1 He was the son of Zeb Bagwell and Allie Sealey.1 Robert Edward Bagwell died on 10 May 1972 at age 60. 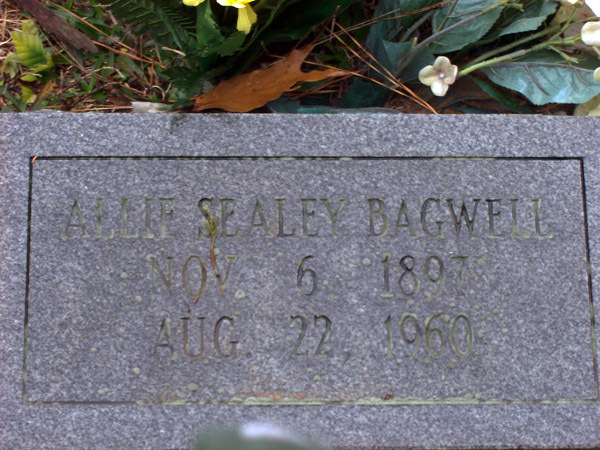 He was buried at Bagwell Cemetery, Wake County, North Carolina. [S2328] Email from Mark Williams dated January 2013 to Hunter Wayne Bagwell; Subject Line: Email about Calvin Berry Bagwell's Descendents. 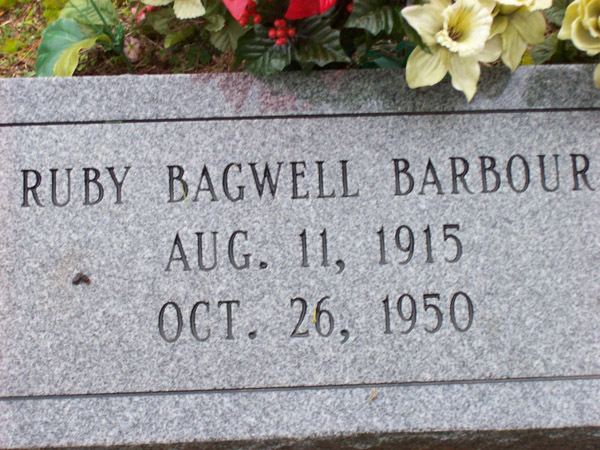 Ruby Elsie Bagwell was born on 11 August 1915.1 She was the daughter of Zeb Bagwell and Allie Sealey.1 Her married name was Barbour. Ruby Elsie Bagwell married Joe Cephus Barbour Jr. Ruby Elsie Bagwell died on 26 October 1950 in Raleigh, Wake County, North Carolina, at age 35. Ruby Elsie was shot 4 times with .32 caliber gun.1 She was buried at Bagwell Cemetery, Wake County, North Carolina. Roy Clifton Bagwell was also known as Roby Clifton Bagwell.1 He was born on 15 July 1918.1 He was the son of Zeb Bagwell and Allie Sealey.1 Roy Clifton Bagwell married Lois Ellen on 7 June 1937.1 Roy Clifton Bagwell and Lois Ellen were divorced after 1940.1 Served in US Army (as a Private in HQ Company 6th Corps) during World War II. Roy Clifton Bagwell died on 24 July 1965 at age 47. He was buried at Raleigh Memorial Park, Raleigh, Wake County, North Carolina. Aileen Jessie Bagwell was born on 15 January 1922.1 She was the daughter of Zeb Bagwell and Allie Sealey.1 As of 19 November 1938,her married name was Ingle.1 Aileen Jessie Bagwell married Arthur Lee Ingle on 19 November 1938 at Johnston, North Carolina.1 Aileen Jessie Bagwell died on 26 October 2006 at age 84. She was buried at Raleigh Memorial Park, Raleigh, Wake County, North Carolina. [S988] Email from Jewel Poole Mangum dated September 22, 2009 to Hunter Wayne Bagwell - Subject Line: Ancestors of Jewel Poole Mangum. Van Procter Poole was born on 6 December 1932.1 Van Procter Poole was the child of Mortimer P. Poole and Lillie Myrtle Bagwell.1 Van Procter Poole died on 7 April 1995 at age 62. 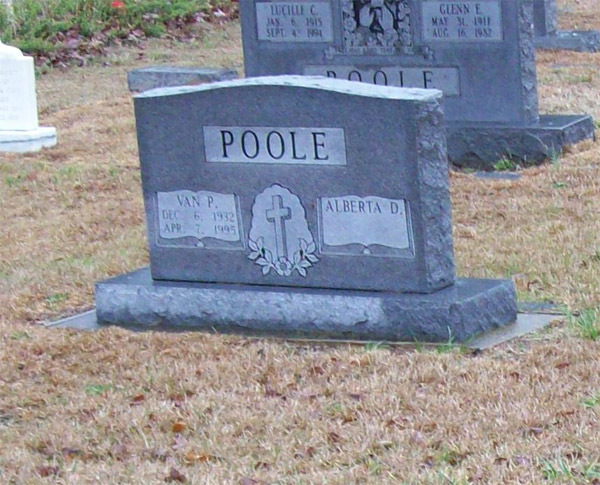 Van Procter Poole was buried at Ebenezer United Methodist Church Cemetery, Wake County, North Carolina. [S1566] Email from Marilyn Poole Pergerson dated December 2010 to Hunter Wayne Bagwell; Subject Line: Dallie Lee Bagwell Descendents. [S562] Interview, Lynda Watkins, November 26, 2008.